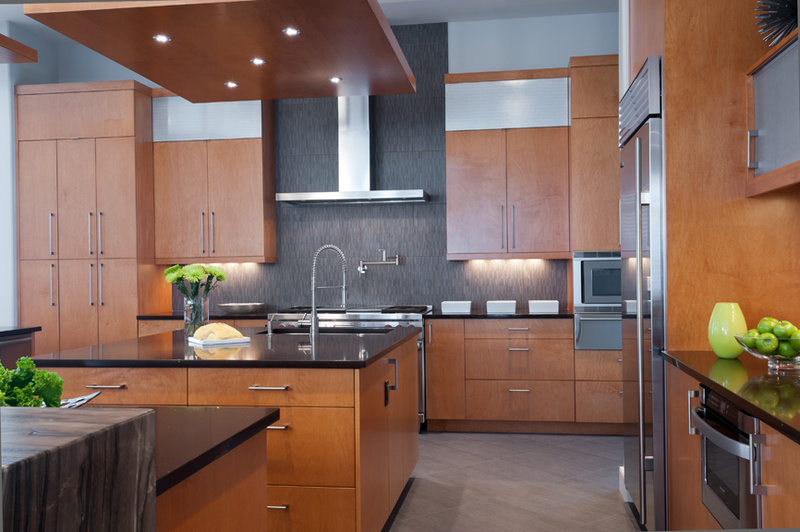 Designed to accommodate a multi-generational family, this modern, sleek kitchen is both clean and functional. Two large islands, a light rail above the island counters and a breakfast and snack wall add unique elements to the space designed by Krista Howard, Krista Howard Interiors. A square-shaped island was included for main food preparation, while an “L” shaped area is for casual dining at the counter. 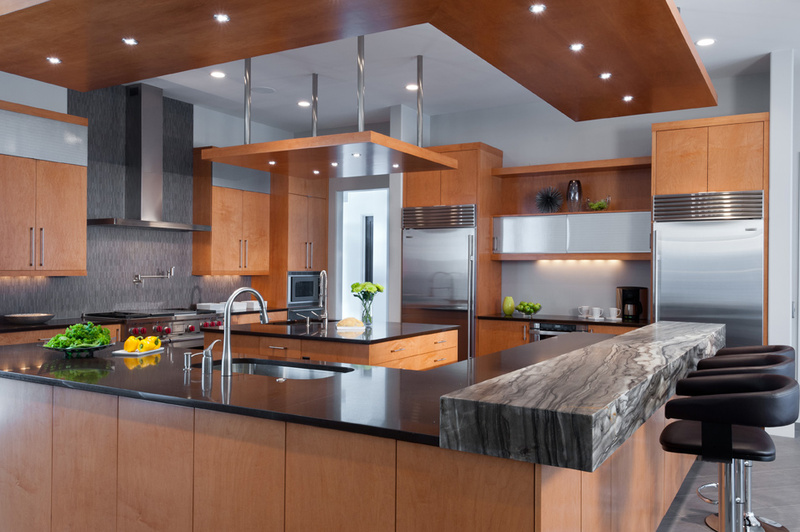 The “L” shaped counter is topped with beautiful waterfall granite that wraps along the vertical side of the cabinet. 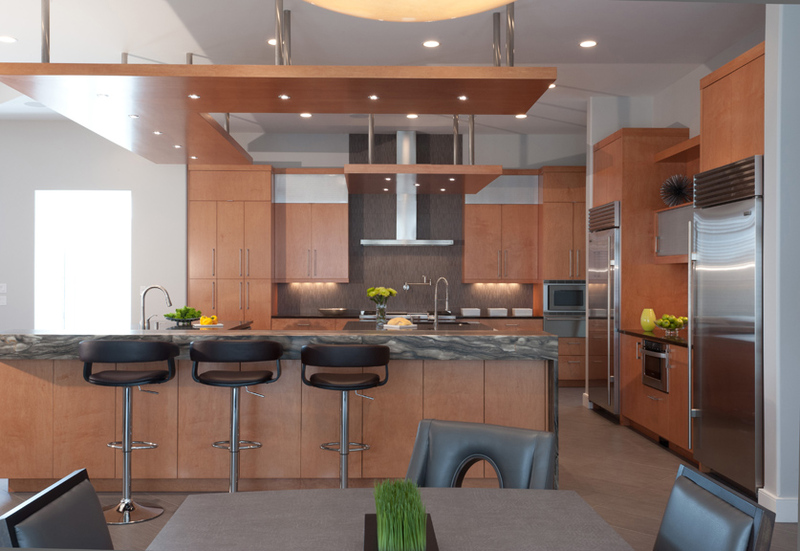 Contemporary wood cabinetry extends to 9’ 6” and warms the space. Along the cabinets in front of the bar stools is additional hidden storage, which has been quite an asset to the space. The drop-down light rail is suspended by sleek steel posts and mirrors the wood finish of the cabinets. The rail is a fabulous alternative to task lighting. Located along the right wall, a breakfast and snack area houses an additional microwave and drawers that store bowls for kid-friendly access. Judges’ Comments: This kitchen screams original. The drop lighting from the ceiling borders the kitchen and gives it a cozier feel. There is a nice variety of different finishes that keeps the space interesting.